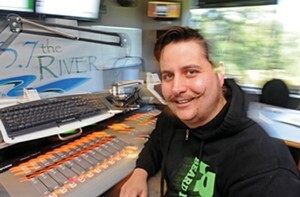 The music director and host of "Afternoons with Dash" on 103.7 The River also happens to serve as vice president of the RVA Beard League. So who better to make a play list for us in honor of Richmond's love of facial hair? You can hear it for yourself online at soundcloud.com/dr-gonzo-4/beard-gang. 1. Cake, "Mustache Man" — The title says it all. 2. The Beards, "If Your Dad Doesn't Have a Beard, You've Got Two Mums" — Not just a song, but a band about facial hair. 3. Gay Blades, "Why Can't I Grow a Beard?" — A pretty unknown band that asks the all important question. 4. Passion Pit, "Sleepyhead" — Most people have no idea what is being said in this song, but listen to the very end. 5. Battlemaster, "By Beard and Throne" — Some local RVA beard love. 6. ZZ Top, "Gimme All Your Lovin'" — Had to include a song from the most famous beards in music.